These images above show Zorro a fox cub, over an eight week period, recovering from a severe case of Sarcoptic Mange after being treated by the National Fox Welfare Society. The treatment we used was Ivermectin along with antibiotics and re hydration fluids. Sarcoptic Mange / Canine Mange / Fox Mange is a terrible condition that left untreated will see the death of the infected fox. We believe that if a condition can be treated then it should be, regardless of whether the householder is unwilling, or unable to pay for the treatment. If you have seen a fox with mange and would be willing to provide food (in the form of a jam or honey sandwiches each night), the treatment can be sent to you free of charge. To receive Free mange treatment and an information leaflet, please click on the Sarcoptic Mange Treatment link. If you are able to make a donation, please do so, we rely solely on public support. We are not advocating a diet of Jam or Honey sandwiches for the UK fox population. This is merely a vehicle for the treatment. Foxes love anything sweet, the local cat population usually doesn’t. So by putting the mange drops into something sweet, we know it will be the fox that takes it, not the cats. To give an indication of the commitment of the National Fox Welfare Society, in an average week, we can send out, free of charge between 150 - 200 bottles of free mange treatment for foxes. 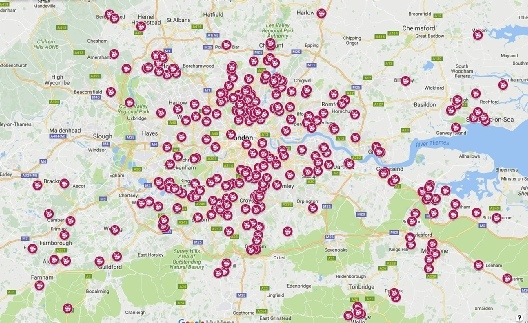 Sarcoptic Mange website for Free mange treatment and to see where the mange is occurring in the UK, some photographs of foxes suffering from varying degrees of mange, peoples letters who have successfully treated foxes with mange. We also have a FAQ for mange plus lots of information to help foxes suffering from mange. More than just fox rescue: Dedicated to the Red Fox in the UK for over 25 years, The National Fox Welfare Society provide free mange treatment to householders feeding foxes in their gardens with Sarcoptic Mange and this alone means each and every year we don't just help a few foxes, not even hundreds, but thousands! All foxes we rescue will be seen by a Veterinary Surgeon in the first instance and price is never put before the life of a fox. Whilst in our care the foxes receive the very best food along with the very best veterinary medicine to aid their recovery. When a fox that has been in our care is released back into the area the fox was caught in, we ensure, when we do so, that the fox has as much chance of survival of any wild living fox. Stress is a big factor for a wild animal and we try to reduce this as much as possible and it is for this reason, we never have an open day. The NFWS is spending thousands of pounds each year researching Toxoplasmosis in the UK fox population in the hope of getting a better understanding of the condition and the best ways to treat it. We are enrolling and equipping new volunteer rescuers across the country almost every month. In 2015 the National Fox Welfare Society was awarded the International Fund For Animal Welfare (IFAW) Animal Action Award and in 2016 we were the winner of the Daily Mail / RSPCA Animal Hero Awards ' Animal Enthusiast of the year'. We also provide a fox sanctuary for foxes that can’t go back to the wild. All our rescuers, Cage trap setters, fox cub fosterers, release site providers are all voluntary, so if you can help either financially by way of a donation or by joining our Society, this would greatly help our vital work continue. Furthermore if you are able to help hands on, please click on the appropriate link below. In anticipation of your support, we thank you. Thank you for visiting our site and if you have any comments, suggestion or questions please email us at natfox@ntlworld.com. 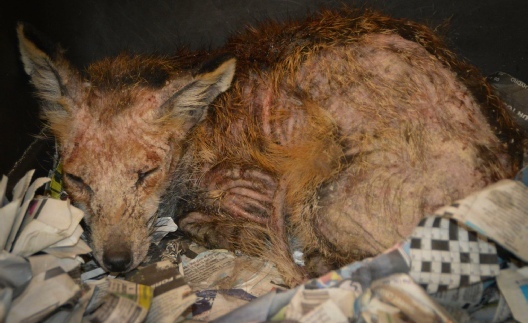 Foxes suffering from Sarcoptic Mange is possibly one of the busiest areas of our work. If your visiting fox looks like any of the above photographs of foxes suffering from mange, then we would possibly look to try to cage trap the fox to bring in to treat. If your visiting fox /s are in the early stages, or anything up to 50% hair loss we can send you free mange treatment that can be added to food each night. 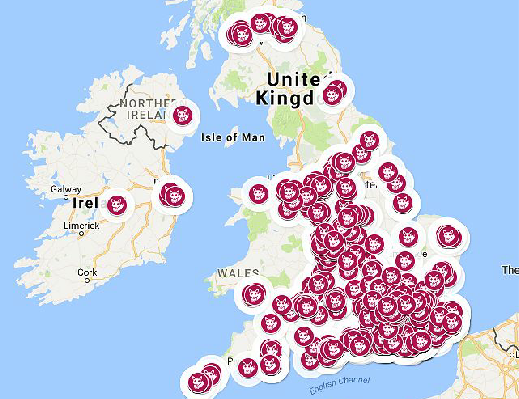 So if you are looking for mange treatment or mange treatment advice, information, or to just see where Sarcoptic Mange in foxes is occurring around the UK please click on the arrow. In an average month we can send out a staggering 500 - 800 bottles free of charge. Every day, of every week of every month and every year, we have recorded every individual case of foxes suffering from Sarcoptic Mange reported to us. 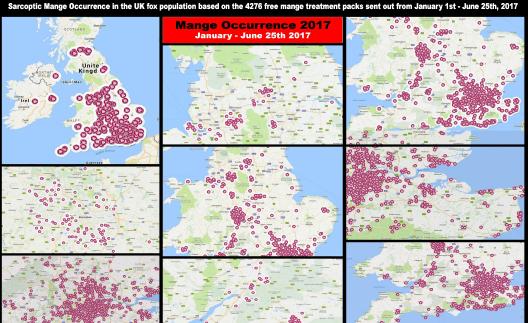 Not only can we provide a visual reference in the form of UK maps but we can also show monthly occurrences of foxes with mange across the country. How can I tell the difference between a fox with mange or a fox moulting? Can my dog or cat catch mange? Can I catch mange from a fox? Is it the same mite that causes scabies in humans? Why do you send out an homeopathic Treatment for mange in foxes when there is conventional treatment available? Pudding the fox makes the front cover! The author has much useful information on how to find, attract and watch foxes, as well as how to photograph them and how using wildlife cameras you can gain an insight into what is happening with the foxes when you are not able to observe them. How to become an amateur biologist, keeping records of the annual diet of your foxes, how to age a fox casualty and how to make casts of their footprints.